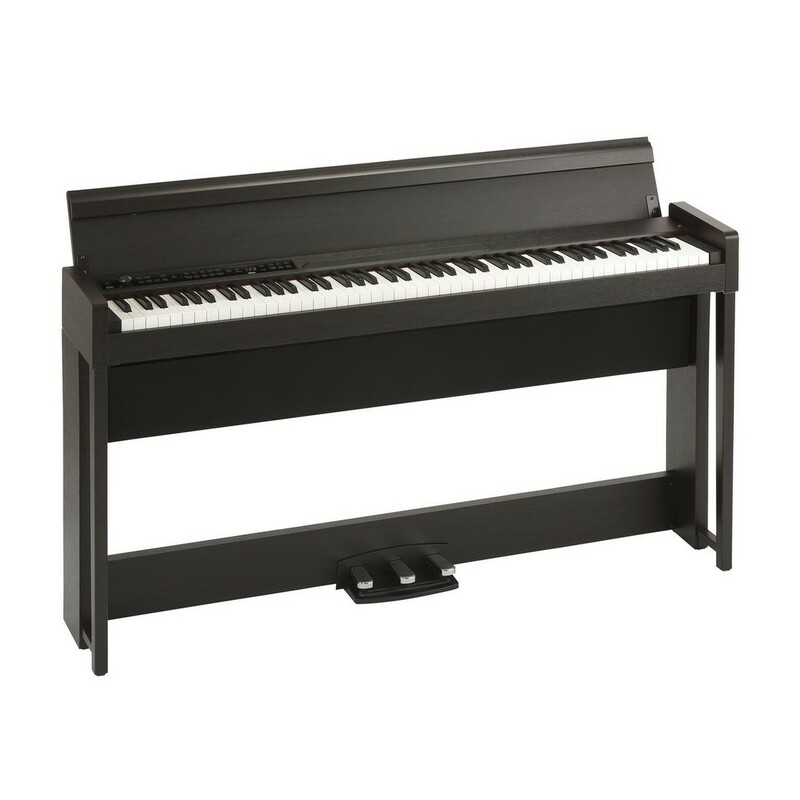 The Korg C1 Air Digital Piano features an RH3 keyboard, which incorporates an authentic hammer feel, just like an acoustic piano. The C1's onboard speaker system includes two 25W drivers for powerful sound projection. The integrated songs are suitable for students looking to develop their skills, whilst the two-track recorder allows you to save your compositions. 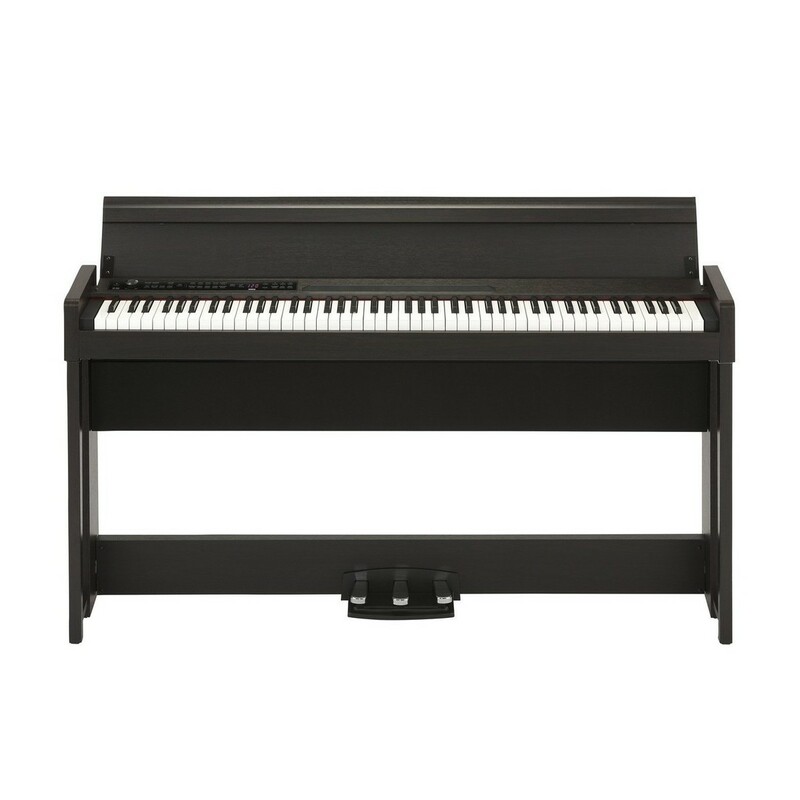 This model's sound engine features 30 high-quality voices including pianos, strings and organs for added versatility. The slim cabinet is both compact and attractive and perfect for any environment. The C1's integrated Bluetooth connection allows you to stream music and connect dedicated apps instantly. With all these innovative functions and contemporary styling, the C1 Air Digital Piano is perfect for any level of player. This exclusive package includes a high-quality Gear4music piano bench and headphones, so you have everything you need to start practising. Following decades of intensive research and development, Korg are proud to present the C1 Air. Housed in a slim, stylish and sophisticated cabinet. The Korg C1 does not compromise between impeccable sound quality and incredible modern design. Finished with a beautiful wooden texture, the Korg C1 Air is made to suit most interior environments. Thanks to Korg’s awesome new sound technology, the C1 Air features two incredible piano sounds. The German sound produces a rounded, rich bass, complemented with bright high notes, while the Japanese tone offers great depth of sound, that allows you to explore a wide range of styles and genres. The C1 Air offers an incredible opportunity to discover your unique style. The touch of the C1 Air accommodates both the classic and the modern pianist. The keyboard is fully weighted, with real hammer action. Serving you the most authentic playing experience. As the lower register keys bear a heavier response to the upper register. The responsive hammer action ultimately delivers an expressive performance. Faithfully communicating even the slightest nuances. All thanks to Korg, the C1 Air comes with Bluetooth compatibility, so you can connect to your smartphone or tablet directly to the C1 Air and use it as a speaker system. Play along to your favourite songs, or connect to the wireless Hi-Fi system. You choose! The Bluetooth function allows your piano to seamlessly connect to your device, giving you total control of your audio output. While the MIDI ports make it simple and easy to connect to other keyboards and MIDI devices. Equipped with 1/8” headphone plugs, you can simultaneously connect two pairs of headphones. With this feature, you can practise and play without being disturbed.